Geauga County is a small, beautiful, mostly rural county East of Cleveland. With a county population of less than 95,000 all of the communities are small, friendly, and beautifully situated. Beachwood Transportation serves each of these communities with reliable, safe, affordable airport transportation service with our fleet of immaculate vehicles. Chardon, the county seat has a population of just over 5,000. Looking for a Chardon taxi ride to CLE – give us a call at (216) 800-6565. South Russell (or Russell Center) is a lovely village with a population of under 4,000. We are pleased to offer South Russell taxi service to Cleveland and CLE airport. Bainbridge Township with a population of less than 1,000 takes great pride in the beauty of their village just as we take pride in offering Bainbridge taxi service to CLE and parts in and around Cleveland. Middlefield Township boasts a population of over 2,500 residents who all love their village. This beautiful rural community is a wonderful place to live and visit. As the citizens take great pride in their village we take delight in offering Middlefield taxi service to Cleveland and CLE airport – give us a call. 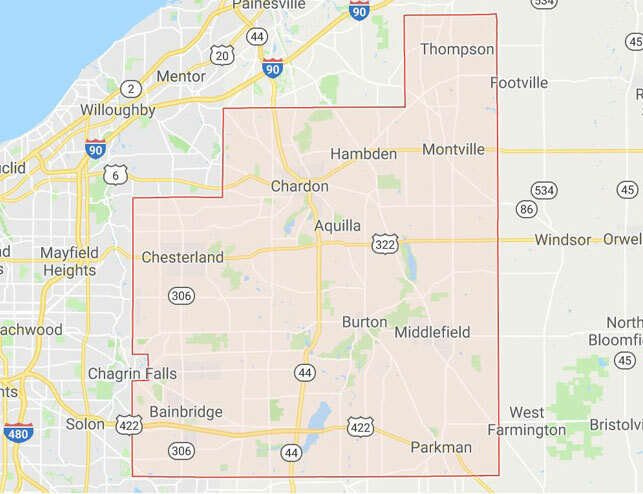 Chesterland is, according to census bureau, a “census-designated place”. It is located in the northwestern Geauga County on 4.4 square miles of land. The village has a population on about 2,500 residents. We are proud to offer Chesterland taxi service to the airport or parts in and around Cleveland. Chagrin Falls was incorporated in 1844 and has a population of around 4,000. Like most villages in the county, it is relatively small covering just over 2 square miles. Looking for a Chagrin Falls taxi ride to CLE. Give us a call. The village of Burton with its population of under 1,500 is a picturesque community that takes pride in itself. The residents enjoy the slower pace than the big city and the small community feel. We are pleased to offer Burton cab service to Cleveland and CLE airport. Newbury is one of the largest cities in the county with a population of over 5,500 people and sits on more than 28 square miles. Large by county standards, it still enjoys a small community feel and a slower pace of life than found in Cleveland and larger metropolitian areas. We love providing Newbury taxi service to CLE airport and all of Cleveland. Beachwood Transportation is proud to offer quality, safe, affordable taxi and shuttle service to all of Geauga County. Give us a call at (216) 800-6565 now to make a reservation.